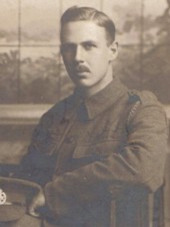 8594 Private Charles Edward Dewsall, 8th Bn. Royal Fusiliers (City of London Regiment), 7th July 1916. 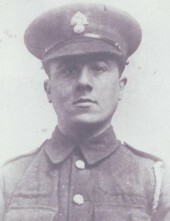 5369 Private John James Duke, 2nd Bn. Royal Munster Fusiliers, 22nd September 1916, aged 19. Pier and Face 5 D.
'Monty' joined the Royal East Kent Mounted Riles (a Yeomanry battalion) in 1909 whilst he was an apprentice shipwright at Chatham dockyard. 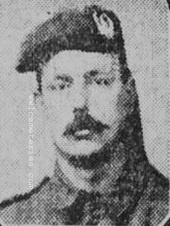 By 1915 he had attained the rank of Sergeant and after the decimation of the Battle of the Somme in 1916 he volunteered to transfer to the 7th Buffs who had suffered many casualties in the battle. His young wife Jessie pleaded for him not to go as they had only recently been married in June 1916. However Monty felt it was his duty as a Sergeant to go. My grandfather William Daniel, who was 12 at the time, remembers him taking him to the local shop for sweets before he left for France in September 1916. 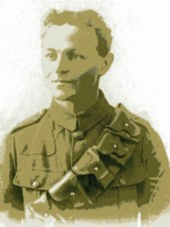 Monty arrived in the front line on October 20th 1916. He took up position in the captured Fabeck Graben trench and was killed instantly by a German shell on the 26th October. A year later Jessie was still arguing with the army over her pension, as despite his rank of Sergeant in the REKMR, the army said that this rank had not been confirmed in the Buffs at the time of his death. 2nd July 1916, aged 44. Husband of Florence Davies, of 18, Lutner St., Burnley, Lancashire. John was a Shropshire man who had move to Lancashire and was living at 18 Lutner Street, Burnley with his wife Florence at the time of his enlistment. 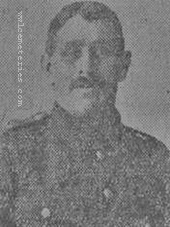 He was a member of the Burnley (Z) company that served in the Accrington Pals Battalion, his date of death varies between 1st/2nd July 1916. John had been born in Wellington, but for a number of years lived at Dawley with his wife Florence. They moved to Burnley (18 Lutner Street) in about 1909 where John first found work at the loom works of Messrs. Pemberton & Co and later on became a watchmaker, It was while still working as a watchmaker that he enlisted into the army soon after the war broke out. John joined the 11th East Lancashire which has gone down into history as the now famous Accrington Pals, He first served overseas in Egypt before coming to the western front in March 1916 and a few months later the battalion went over the top on July 1st 1916 ( The First day of the battle of the Somme). Florence received word from the War Office that John had been killed in action on July 1st or 2nd 1916 and with his body never been recovered he is now remembered on the Thiepval memorial Pier and Face 6c. John left behind a widow and 7 children, 4 of whom where quite young. John and/or Florence must have still had ties with Dawley as a memorial service was held for John at the Dawley Parish Church on the 29th August 1916 and his name is on the Dawley memorial in the rest rooms. It might be that Florence had returned to live in Dawley on the death of her Husband. 30th June 6.15 p.m. Marched via Courcelles to position in assembly trenches (arriving in position 4 a.m. 1.7.16). 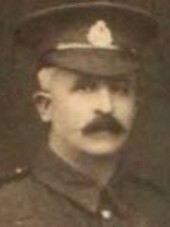 1st July The assembly trenches for the attack on Serre extended from MARK COPSE to MATTHEW COPSE inclusive with the 12th Battn. York & Lancaster Regt. on the left and the 93rd Brigade on the right. The 13th and 14th Battns. York and Lancaster Regt. were in support of the 11th E. Lancs. Regt. & 12th York & Lancs. Regt. The battalion was ordered to go forward in 4 waves accompanied by details from the 94th Machine Gun Company and the 12th Battn. K.O.Y.L.I. (Pioneers), the hour for attack being 7.30 a.m.
2nd 1 a.m. The battalion remained in the front line until 1 a.m. on the 2nd July when relieved by the 13th Battn. York & Lancaster Regt. During the attack Battn. Hqrs. was situated at head of Sap C. (K 29 a 93 ref map - 1/10,000 HEBUTERNE Trench Map). Total casualties:- Officers killed 7, missing 1, wounded 13 including the Commanding Officer. Other ranks killed 86, wounded 338, missing 140. On relief, the battalion withdrew to ROLLAND trench (4th line) when reinforcements of 4 officers & 60 other ranks came up. Pier and Face 9 C and 13 C.
Son of Jules and May Dent-Young, of 55, Lyncombe Hill, Bath. Son of Hannah Mary Dewsall, of 49, Southerton Rd., Hammersmith, London, and the late William Dewsall. ​Picture courtesy of Lynne Thompson. 3rd September 1916, aged 27. Son of Jane Dodgson, of Town Foot, Preesall, Fleetwood, Lancs., and the late John Dodgson, brother of John Dodgson. Picture courtesy of Steve Singleton. BORN: 7th January 1895 at 6 Preston Street, Rosewell, Midlothian. Son of John Duffy (Coal Miner) and Catherine Houston. Yesterday Mrs John Duffy, 36 Leslie Street, received official intimation that her son, Pvt. 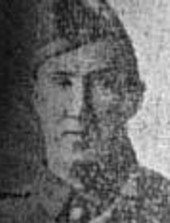 John Duffy, Black Watch, who had been missing since 30th July last, is now presumed to have been killed on that date. He took part in a charge while suffering from a festering heel, and though advised by his comrades to go back to the doctor he declined, stating he would “stick with the boys”. His comrades carried his equipment over the trench for him, and after they got separated he was never seen again. Pvt. 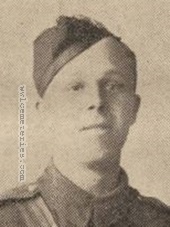 Duffy was a member of the local Territorials, was called up at the outbreak of the War, and went with the first local detachment to the Front. Aged 21 years, he was a native of Blairgowrie (sic), and before the War was employed by Mr Murray, fruit grower, Essendy. Exactly six months before his death he was home at the funeral of his father. 26th September 1916, aged 30. Son of Mr. and Mrs J. Dyke, of Piddlehinton, Dorchester. Sydney Albert Dymond. 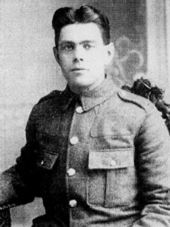 Born 1st May 1894 in Hendon, died, aged 21, 10th July 1916. Son of Thomas William Dymond and Grace Maud Dymond. Beloved husband to Elsie Dymond, he was married June 26th 1915 . Residence 69 Harlesden, Middlesex. He was the father of Grace Eva Mourd Dymond who was born 13/01/16 and who he never got to see but he was never forgotten. He fell whilst serving under the 34th Division on 10th July south of La Boisselle. The 13th Rifle Brigade found itself attacking from the old British front line at 8.45pm, not as part of a co-ordinated action but alone, they became the focus of every German machine gun and artillery piece in La Boisselle, due to a message reaching them to late. 20 officers and 380 other ranks were killed along with the companies second in command and the four company commanders.